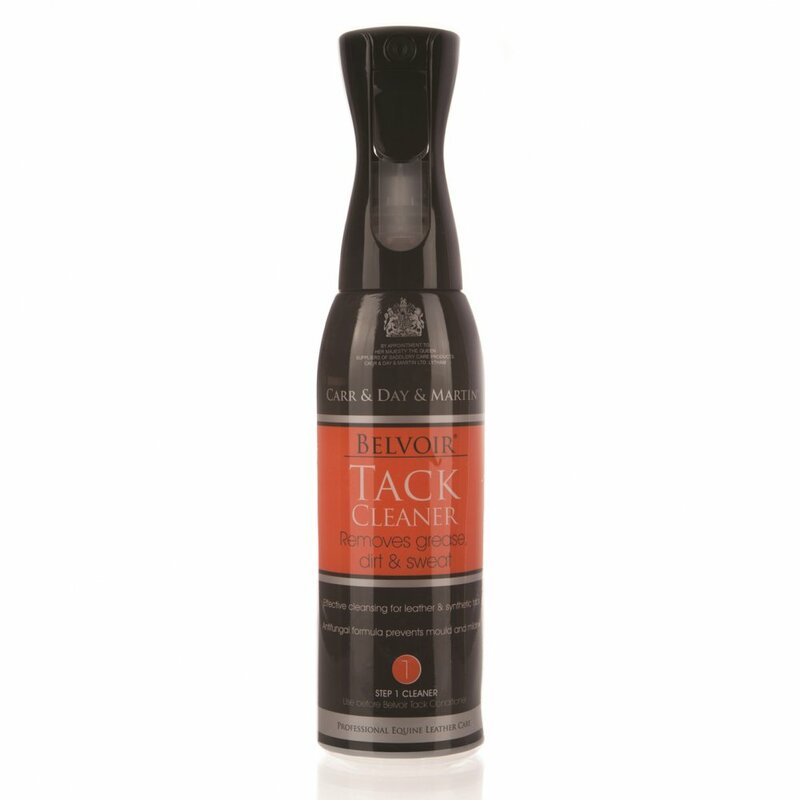 Belvoir Tack Cleaner Spray is the first step in keep your saddle and tack clean and conditioned. Belvoir spray tack cleaner removes dirt, grease and sweat without hard work and leaves a perfect clean surface for the application of Belvoir Tack Conditioner Step 2 or other leather conditioning products. Belvoir Tack Cleaner is made from a blend of cleaning agents that are anti-fungal to prevent the growth of mould, and can be used for removing mould growths already present on leather. This saddle soap is also pH neutral to ensure it will not rot the stitching on your saddle or bridle. This leather cleaner is packaged in the innovative Equimist 360' bottle that enables spraying from all angles for those hard to reach areas. The bottle has minimal waste and produces a fine mist to evenly apply cleaner to your saddle. Belvoir Tack Cleaner should be sprayed directly onto the leather and wiped off with a clean cloth or sponge. For areas with ingrained grease spray this saddle soap on and leave for approximately 5 minutes before wiping. When cleaning mould from tack ensure the cloth is disposed off after use. Belvoir Tack cleaner can also be used on synthetic leather (always test a hidden area first) but is not suitable for suede or nubuck. This 600ml bottle of leather cleaner will last up to two months depending on use.